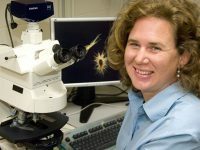 The microbial oceanographer was elected a Fellow of the prestigious American Academy of Microbiology in recognition of her scientific achievement. I grew up outside of Chicago and I wasn’t a Boy Scout, so sometimes I feel like I missed out on learning the type of practical—albeit rarely used—skills that would have garnered merit badges. 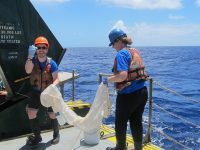 Now that I’m nearing the conclusion of my fourth research expedition at sea, I think I have amassed a few badge-worthy tricks. I’m writing from where L’Atalante is currently parked, 18S 170W, right in the middle of a giant, anomalously high sea surface chlorophyll patch. 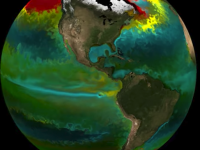 Such a high concentration of chlorophyll—a pigment that helps photosynthetic organisms harvest energy from sunlight, and the one that’s responsible for the green color of plants—can mean but one thing in the ocean: a phytoplankton bloom. I’ve never been good at navigating. When I come out of the subway I invariably turn the wrong direction, even though I already have my nose buried in Google Maps, and then walk around the block to save face. Greetings from the center of that eddy I mentioned in my last post! We’ve been here for five days so far, but tomorrow we are finally moving on. We have completed the first two stations of the OUTPACE cruise and we are steaming to Station 3. By noon tomorrow we should be in the center of an eddy that our colleagues back on dry land have used satellite data to identify. The OUTPACE 2015 cruise has set sail on February 20! We left port in Nouméa at 8:30 a.m. last Friday morning. I lost sight of land around 10 a.m. or so, and I won’t see it again until we return to port in Papeete, Tahiti on April 3.